When JAPAN fissured into various splinters, I did not immediately pursue Mick Karn’s solo career, seeing as how I had heard his debut solo single, “Sensitive” back in the layoff following “Tin Drum” and their live swansong “Oil On Canvas.” I was appalled at the club-footed attempt at pop from this art rocker. I haven’t played the 7″ since and sat out “Titles,” his debut solo album that followed. I moved on with various Sylvian projects but when I chanced to see “Dreams Of Reason Produce Monsters” in the bins [was it as Digital Sounds, the then innovative CD-only store… I think so] I decided to take a chance on it. That was one of the best moves I have ever made because I have been enraptured with this album for 32 years and that shows no signs of stopping. The album began with a ponderous fretless bassline of brutal simplicity; just two notes slithering across the soundfield while the lumbering, measured drum pattern laid down a tribal rhythm not a million miles away from where Julia Fordham would take her breakout “Happy Ever After” the next year. But here is was the furthest thing from pop. More classical than jazz, even when the heraldic horns burst into the bass heavy music bed with the musical theme. The thrilling arrangements here were by Karn and Steve Jansen; his ex-bandmate who played drums and keys but the bulk of the music was down to multi-instrumentalist Karn. He played bass, keyboards, various reeds, accordion, drums, percussion, and dida. No lead guitars manifest on this album. The vibe on this one was incredible. It suggested primeval monolithic power buried deep beneath the earth for eons, now awakening. If all of that sounds a little Prog, I’ll just avert my eyes, whistle and point out that the song title was first used by ELP! “Language Of Ritual” began with ethnic field recordings of bazaars on the other side of the world jostling with more methodical beats and a phalanx of clarinets and bass clarinets. As the song progressed through its length, it became gradually Westernized with the introduction of piano until as the coda played out, all vestiges of the Turkish city where the song began were faded out completely, giving the piano the last word. Of course, we fell in love with Karn’s fretless bass in JAPAN, but thus far, his serpentine fretless bass runs were thin on the ground. Not here. Moreover, the hatchets had been buried by now over the girlfriend problems that had broken up the band. 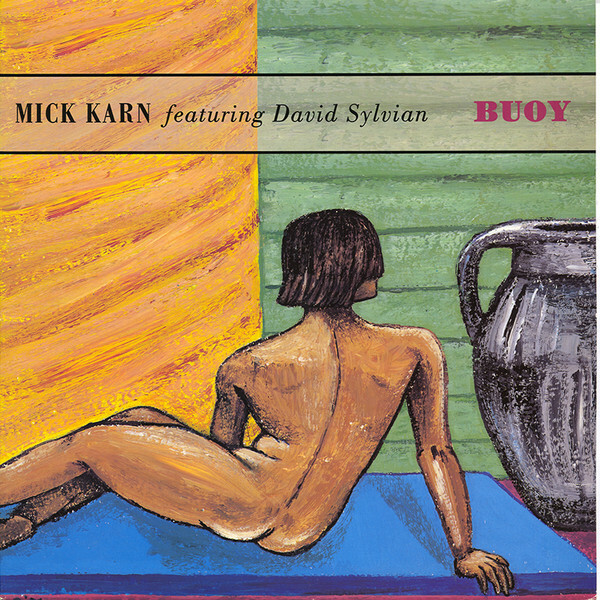 Karn had enlisted David Sylvian to sing and write lyrics for a pair of songs here and the obvious single was the jazz pop of “Buoy.” It was full of hooks yet left field enough to satisfy on that level. You know… the Prog level. This wonderful single had 3/4 of JAPAN playing and singing on it and it suggested that the band who had made “Tin Drum” still had some fight left in them. Ambient washes of synth heralded “Land,” the one song here where Karn did not compose the music. This was a berth given to Steve Jansen and it fit right into the album like a puzzle piece. The gentle marimba wove a haunting melody through the number while it retained the methodical rhythmic bearing of much of the music here. This was music that was quietly insistent and it would brook no interruptions of its forward movement, no matter how slowly it progressed. The second half of the album began with “The Three Fates” which was one of the lighter moments here. The lead melody gave Karn a chance to give his expressive accordion playing the spotlight. Sounding here like nothing less than Toots Thielmans playing one of his harmonica solos that fairly radiate sunlight. The song is so soulful, you’d be forgiven for not noticing that this was the second song title cribbed from ELP in the album! The second song with David Sylvian singing was “When Love Walks In,” A somber ballad, it felt more like something from Sylvian’s “Brilliant Trees” album than the first song. The jazzy underpinning kept the song half hidden in shadow. This led aptly into the title track that followed. “Dreams Of Reason” was a melody that stated its theme and kept it moving in a multipart rondo for the entirety of the brief song. Finally, the mood, which has been darkening ever since “When Love Walks In,” calcified with the closing chorale “Answer.” The album was ending on a serious, questing note as the church organ and massed choirs of children, women, and men erupted into a fully blown hymn. Karn felt that the album had been a flawed reaction to the accolades he had collected for his bass playing up to that point, and his insecurities with that praise fostered the intention here to stake his claim as a composer as opposed to a bassist. He considered it his weakest album, but I can’t disagree more, no matter how much I cherish his fretless playing. The studious tone of this album, with hints of lighter playfulness, mark it was a sound that grabs me by the lapels and doesn’t let go for the very swift 40 minutes of its running time. When I hear this album, it feels to me like the next logical step of a mind that had already created the amazing “Sons Of Pioneers” six years earlier. I’ll go further and claim that of all of the post-JAPAN albums, this one is the one that I return to the very most as it never fails to delight the ear and mind. This entry was posted in Core Collection, Your Prog Roots Are Showing and tagged 1987, David Sylvian, Japan, Mick Karn, Steve Jansen. Bookmark the permalink. Terrific review and I completely agree with your sentiments – EXCEPT that you need to revisit “Titles”! I felt like you for ages and then went back to it a couple of years ago and it totally clicked for me. Never say never! PPM – apologies, mate, been meaning to subscribe instead of just dropping in from time to time, will rectify that now! As others have pointed out, Mick Karn’s solo catalog is a bit scatter-shot after “Bestial Cluster”, but his collaborations are pretty darn consistent. The Jansen-Barbieri-Karn albums are great – “Ism” is another one that I skipped at the time, recently revisited and quickly acquired. His collaborations with Bill Nelson, just a few tracks, are tantalizing for the promise of more they held. Dalis Car is all-time, even his work on Gary Newman’s “Dance” is worth your time. His bass work is so unique, it’s immediately recognizable. One of my all-time favorites bass players (along with JJ Burnel). I’d say the obvious single was When Love Walks In! I don’t see it as sombre though. How can a song about love walking in be sombre? I do note the likeness to Brilliant Trees, would’ve sat nice between Weathered Wall and the title track. Check out Bestial Cluster, Polytown and Each Eye a Path if you haven’t already. I wasn’t fussed on Titles except Tribal Dawn. Oh and Saviour Are You With Me is fun. kelvinhayesglobal – I have a low number copy of “Bestial Cluster,” but after that, I lost track of the Karn solo career. Possibly owing to the big dampening on purchasing that happened for me in ’93-’94. I moved and bought a $4500 computer. That will have an effect. Just because love walks in does not necessarily mean that it’s doing you any favors, every time. The music on that one is reticent and evasive to me. Oh…..you MUST get a copy of “Titles”!! One of my absolute favourites of all time-along with the Dali’s Car album-I still play both weekly. “Dreams of Reason…” is a lovely album but does not move me anywhere near as much.Great review though. I have many of his later albums and collaborations too,but “Titles” is a masterpiece. Gavin – Easier said than done, sir! I have not seen a copy in 27 years and counting. Trust me, the next time I see one, it’s mine. Hm, I’m falling into the camp of Dreams being a better record than the worthwhile Titles, but I like Bestial Cluster a lot too. He did some nice work after that, there are some gems on every record, but over all, his later records felt repetitive to me. Heard one, you’ve heard ’em all. But it’s a lovely thing to have heard! Same thing with Jansen/Barbieri. JT – Leiber Gott Im Himmel! Your comment didn’t go into the spam. I wish I figure out why that happens 95% of the time. Given that Karn regretted not playing more bass on “Dreams” I feel that perhaps that’s why I love it so much. We have lots of JAPAN albums where that bass is vying for our attention with the rhythms of Jansen.. Here he can let his accordion playing take the spotlight and it’s just as stunning. Your review prompted me to check whether a cheaper copy of Dreams was available out there, (it’s crept up in price) and I got lucky finding one for £12. Just gave to wait for two weeks as it wings it’s way from the USA. No idea why I’ve never bought it before! I have to reiterate what everyone else has said. Firstly ‘Dreams…’ is a fantastic album and Buoy is gorgeous but it does point towards Mick wanting to get away from his classic bass sound which over the years went further and further away into freeform jazz styling’s which are difficult to listen to and not easy to remember afterwards. It’s interesting that the ‘other three’ members of Japan all admitted to lacking in confidence following the implosion of Japan hence Mick’s first single is a cover version of a song he heard in South America which he changed the lyrics. Also for some very weird reason he decided to record it with Kim Wilde’s brother, hence it sounds more ‘poppy’ then anything else he ever recorded, but even then on the original version his vocals are so hidden away in the mix you can hardly hear him. Thankfully he recorded the rest of Titles with Colin Fairley who engineered Quiet Life and GTP so its sounds much better. I love Titles because it was recorded immediately after Tin Drum so, like Sylvian’s Bamboo Music/Houses, it has a similar genetic feel. In fact I was disappointed that when ‘Oil On Canvas’ came out Sylvian, Jansen and Baribieri all had little instrumental additions but Karn didn’t. For me that missing piece is ‘Weather The Windmill’ from Titles so have always wondered if it was originally meant for it. Titles was of course recorded with Jansen and Barbieri and David Rhodes (who’d played with Japan on the Art Of Parties tour). Mick’s unique and signature bass playing is to the fore in this album, more than any of his subsequent solo or collaborative outings so for me it’s my favourite, though it wasn’t the A side of the Sensitive single that made me get it it was actually the B side ‘Sound Of Waves’ which is amazing, and interestingly the track Mick made a video for (with Hazel O’Connor in it) rather than the A side though I’ve never seen it and it isn’t on YouTube. Interestingly if you’ve read the Japan bio in it it states that Mick wanted to record a solo album after GTP but Jansen talked him out of it as he felt it would ‘undermine their working as a band’, so he put it on hold until after Japan split. There is a very interesting video of youtube of Mick playing backing to, of all people, Angie Bowie reading poetry in March 1982 and Mick is playing the bass lines from ‘Dali’s Car’ and (I think) ‘Artemis’, so must have had a number of pieces in development for a number of years. Also the bio says that after Titles he presented Virgin with a follow up album but they declined it. I assume that this ‘lost’ album eventually became some, if not all, of ‘The Waking Hour’. Possibly Virgin did pick up ‘Dreams..’ because of Sylvian’s vocals. It took Jansen and Barbieri much longer to gain their confidence only recording a soundtrack album in 1984 and then the ‘Dolphin Brother’s Catch The Fall’, which is basically trying to be Tin Drum 2, in 1987. It was only when Jansen, Barbieri and Karn set up the Medium label that they really took off, releasing 15 albums between 1993 and 2001 either as a trio, duo or solo (with other musicians guesting) plus doing lots of session work. Also following the failed reformation attempt of ‘Rain Tree Crow’ in 91 they recorded a mini album with Jakko on vocals and guitar and three songs with Midge Ure with the idea to record a full album, which sadly never happened. So my view is that Japan splitting was, eventually, actually a good thing as it released Karn, Jansen and Barbieri to much greater things than if they had stayed under Sylvian’s shadow. 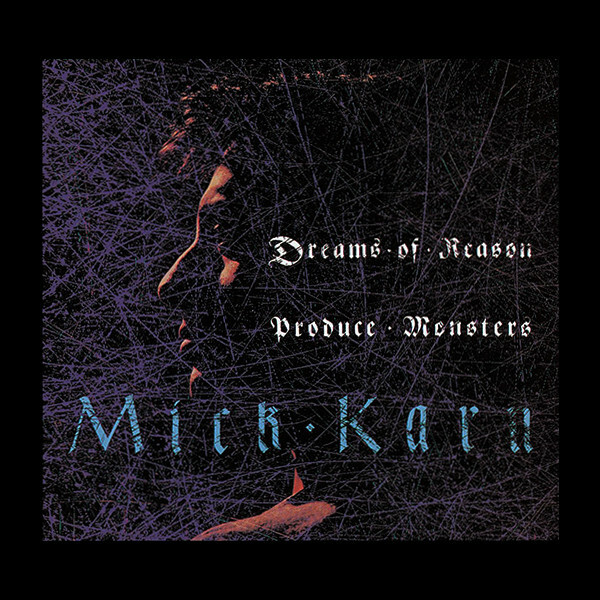 I absolutely agree that Dreams Of Reasons Produce Monsters is the stand out Karn album. It’s not just that it is, without real intent, the logical continuation of the direction Japan was heading down, it is beautifully designed executed as an expression of his left field Pop talents. It has always been an equal companion piece, for me, with Sylvian’s Gone To Earth. Both albums have an other worldly soulfulness that has always impressed me. If you add in Jansen and Barbieri’s Dolphin Brothers release Catch The Fall, you can see that there was something very special “in the water” for those Japan members and they provided us an embarrassment of riches.